Just got a new iPhone 6 Plus and has been tired of transferring iPhone data via Apple ways such as iTunes, iCloud, desperately need a faster way to transfer your valuable data like photos, music, video and contacts from the old iPhone? 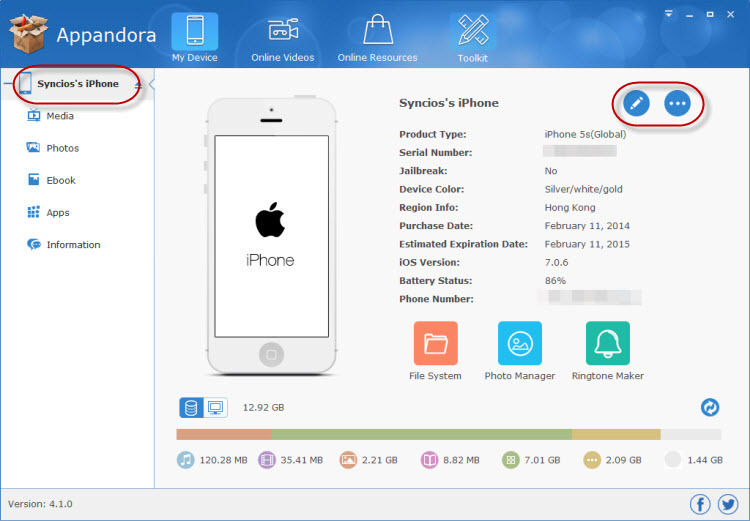 Do not worry, this free Appandora iPhone Transfer enables you to move all data from old iPhone to iPhone 6 Plus. In this guide, we will show you how to transfer music from old iPhone to new iPhone 6 Plus freely and quickly. 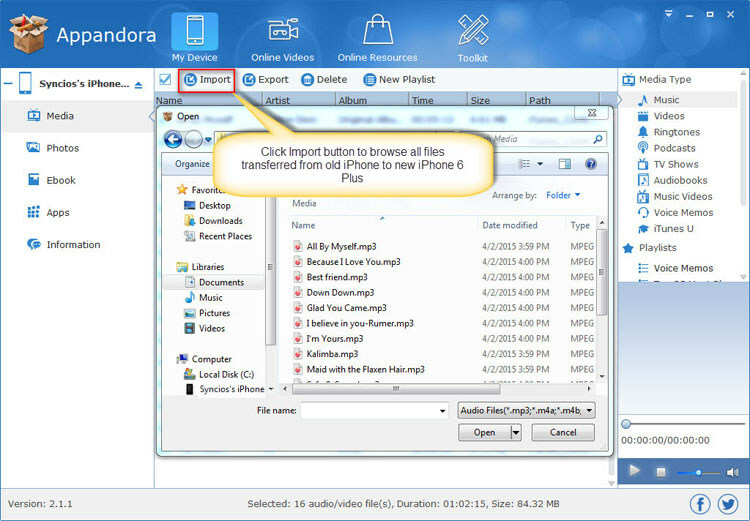 Step 1.Download and install Appandora iPhone Music Transfer to your computer. Note: Please make sure that iTunes is already installed on your computer for running this free Appandora iPhone Music Transfer correctly. But you do not have to launch iTunes when running Appandora. Step 2.Plug your old iPhone into your PC via USB, then run Appandora. 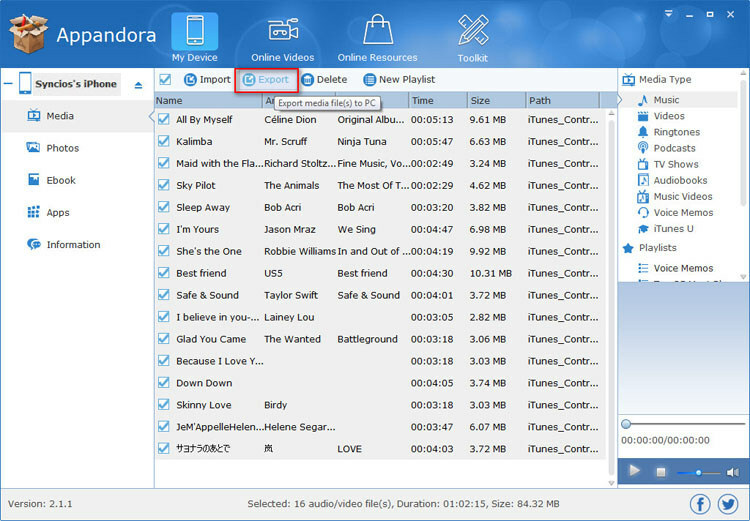 Step 3.Press Media tab on the left panel of Apandora iPhone Transfer and click Music from the right panel, then all songs will be displayed in the main window. Step 4.Just choose those songs you would like to transfer, then press Export button and choose backup location in your PC. Click Ok to back up music from old iPhone to your computer. Step 5.Once the backup is completed, disconnect the old iPhone and plug in new iPhone 6 Plus. Step 6.Go to Media tab, click Import button to browse to the exact location where you store the old iPhone files. Press Shift key and select all songs, then click Open. Now, all songs have been successfully transferred to new iPhone 6 Plus. You can also move other files like Movie, Ebook, App, Contacts, Notes, Audiobook, etc. from old iPhone to new iPhone 6 Plus as the same way. Detect device info and media info intelligently.